After 4 years of work, and for the first time since the 1970s, we have a new master plan for downtown Toronto. Our TOcore plan - a plan to build a more liveable and sustainable downtown for the next 25 years – was approved by City Council yesterday. As our City grows, we must ensure we are building liveable neighbourhoods – places where we invest in the critical services that truly make our communities thrive. Over the last four years, we’ve been hard at work developing a plan for the downtown to address both unprecedented growth and the deficit in our infrastructure. The TOcore vision approved yesterday includes a Downtown Secondary Plan - to manage and guide growth and development - accompanied by five Infrastructure Strategies - Community Services and Facilities, Energy, Mobility, Parks and Public Realm and Mobility. The new Downtown Secondary Plan set out new policy that enshrines many critical community-building priorities we have championed these past four years together – 2 and 3-bedroom units to build communities for families, prioritizing affordability and affordable housing, and much more. The five Infrastructure Strategies will be used to both guide development review going forward, to ensure that with growth comes the services our communities need, and to guide City investment over the next 25 years. Thank you to the residents' associations, City staff, and local residents who worked so hard together on this vision over the last four years. Below you'll find further information on how to access the plan, as well as updates on our work to improve safety at Fraternities and Sororities, Community Environment Day this weekend, and much more. As always, don't hesitate to reach out at any time. For too long fraternities have existed in a legal grey area: not licensed by the city and not accountable to the University. Yesterday, we took a critical step in improving the safety of those who live there, those who visit them, and their neighbours – City Council finally voted to license Fraternities and Sororities. For decades fraternities and sororities have long been exempt from the City of Toronto's multi-tenant housing framework, which allows for accountability and regulation at a Municipal level. In June 2017 I asked City staff to look into a licensing framework that would ensure that these houses meet building codes, and provide a safe and healthy environment for the students and alumni that live there. At the May 4th meeting of Licensing and Standards Committee, I was happy that Committee voted to improve upon the recommendations of City staff, and to move forward with implementing a licensing framework for fraternities and sororities. My hope is that such a framework will not only reduce the risks for the students living in and attending these homes, but also for the residents in the community in which they reside. Despite attempts to mitigate issues, reports of problematic behaviour such as issues with garbage, extreme noise and property standards violations persist. Now, frats will be safer for the people who live in them, visit them, and live near them. Thank you to everyone who worked so hard on this issue for so many years. For more information on TOcore, the Downtown Secondary Plan, or any of the five infrastructure strategies, please visit the City's website. Building safe and accessible communities is a critical part of our work. Ensuring our streets are safe for everyone who uses them, our parks are accessible and vibrant, and more are just some of the priorities we've been working on together. This past week I expanded our annual community safety walks into a Safety Week all across Ward 20. I hosted walks in more neighbourhoods than ever with staff, police, residents and business owners to identify local public and personal safety issues. You can read more detail about some of the issues that were raised here. My office is compiling all the comments from the community safety walks and coordinating follow-up actions with City divisions and our partners. If you weren't able to join the safety walk but want to raise any additional issues, please feel welcome to email me at councillor_cressy@toronto.ca. Reminder - Community Environment Day 2018 May 26th! We are happy to announce the Ward 20 Community Environment Day 2018 will be on Saturday May 26! We're very excited to celebrate spring with the community! Safe disposal of household hazardous waste ex. cell phones, small electronics, fluorescent bulbs, unused medications, propane tanks, batteries and more! Please join me on Saturday, May 26th for our Ward 20 Community Environment Day from 10am-2pm in the Central Tech parking lot. This is one my favourite days of the year and I hope to see everyone at this fantastic community event. The first stage of work has now begun on the John Street Cultural Corridor! We will be holding an official construction kick-off in the coming weeks to celebrate the beginning of this transformative project, but preliminary work has now begun. Through a lengthy public consultation and Environmental Assessment (EA) process during the last term of Council, the vision for John Street emerged. A pedestrian-focused design, John Street will see the elimination of 2 lanes of traffic, narrower lanes, greatly expanded sidewalks and removal of curbs, so there is no barrier between the road and pedestrian realm. These key design components, in addition to upgraded lighting provided by the local Business Improvement Area, new event spaces at intersections along the Corridor, and landscaping and pavement treatments, come together to create a slower, safer space for everyone. As a Cultural Corridor, the design envisions a street regularly closed for events, sustained periods throughout the seasons, cultural events and more, creating the feeling of a new public plaza space along John. With a focus on creating a new pedestrian corridor, the overall design of John Street seeks to slow down all road users, including cars and bicycles, to make the street safer for all. Picture some of the unique streets in our very own Kensington Market – Baldwin Street and Kensington Avenue come to mind. These streets are narrower, and by design move much slower than countless other corridors that function to move people at a faster pace through the area. The new design for John Street, with expanded sidewalks, curb elimination and pedestrians as the focus, seeks to slow down the pace of the street itself. Some underground construction work to support the streetscape improvements will begin by utility companies ahead of the city contract for construction work. Toronto Hydro is the first utility partner and will begin electrical and civil work improvements on John Street north of Queen Street and on Queen Street between John and Beverley streets. Please see the detailed construction notices from the City and Toronto Hydro for further specifics on the beginning of work here. We’re in the middle of a comprehensive revitalization of St Andrew’s Playground and the former Waterworks building. Work is well underway on the Waterworks, which will include a brand new 54,000 sq. ft YMCA built in partnership with the City of Toronto, 15 new affordable housing units administered by Artscape, residential market housing, extensive heritage restoration and conservation, and a dynamic food hall and new commercial uses that will animate and bring life back to the Waterworks Building. In addition, a 50-bed youth shelter (Eva's Phoenix) is already operating at the Brant Street end of the building. We will also be expanding St Andrew’s Playground to incorporate the existing surface parking lot on Maud Street, and we are working on plans to improve and revitalize the older portion of the park. Please join me early next month to advance the plans together for the expansion and revitalization of St Andrew’s Playground. City of Toronto Parks staff will provide an update on work so far, projected timelines and next steps, and lead an interactive workshop to generate design ideas for the future of the park. I hope to see you there on Monday, June 4, 2018, from 6:30 to 8:30 pm at Metro Hall in Room 308/309. Community Compost Days continue in June with our final date, rescheduled from earlier in April. There will also be plenty of compost available at Environment Day on May 26th! The City of Toronto is hosting a public consultation to discuss business property tax policy options and challenges. To help protect businesses from property tax increases arising from recent reassessments, City Council approved property tax policies for 2018 that expand capping protection for eligible properties. City Council directed staff to engage in public consultations to review additional property tax options for 2019 and future years, as well as any potential requests for legislative change to enable such options. Commercial, multi-residential or industrial property owners can provide their feedback by completing an online survey. Visit http://cotsurvey.chkmkt.com/propertytaxpolicy to fill out the survey before June 1, 2018. Written comments or feedback can also be emailed to 2018TaxConsultation@toronto.ca. Now that the weather is warming up, Toronto Public Health is sharing tips to keep cool and enjoy the outdoors safely during hot summer weather. Extreme heat is associated with preventable heat-related illnesses that range from heat stress to heat stroke and death. Heat can also worsen pre-existing conditions such as chronic cardiovascular and respiratory disorders. Vulnerable groups most affected by extreme heat include infants and young children, socially isolated seniors, people who are experiencing homelessness, people with underlying medical conditions or chronic illnesses, individuals with limited mobility or certain mental health illnesses, and people living in apartment buildings without air conditioning. Based on information from Environment Canada, the Medical Officer of Health will issue heat warnings when a daytime high temperature is forecast to be greater than 31 C together with an overnight low temperature greater than 20 C for two consecutive days; and/or the humidex is forecast to be greater than 40 C for two consecutive days. During a Heat Warning, members of the public are encouraged to visit family, friends and neighbours, especially members of vulnerable groups who are at greater risk of suffering from heat-related illness, to make sure they are cool and drinking plenty of fluids. • Drink lots of water even before you feel thirsty. • Visit air-conditioned places such as shopping malls, local libraries and community centres. • Take cool showers or baths or use cool, wet towels to cool down. • Wear loose, light-coloured, breathable clothing and, when outdoors, wear a wide-brimmed hat. • Avoid the sun and stay in the shade or use an umbrella. • Plan or reschedule outdoor activities to take place during cooler parts of the day. • Do not leave elderly people, children or pets unattended in a car. In addition to swimming pools, beaches and air-conditioned shopping malls, there are many other places where people can go to escape the heat, including the City's cooling centres. These locations are air-conditioned places for people to rest indoors and receive a cool drink and light snack. Staff who are trained to assist residents affected by the extreme heat are on hand at the seven locations. More information about the City's cooling centres is available at http:www.toronto.ca/health/keepcool. Are you a homeowner looking to renovate your home? Are you interested in making your home more comfortable & energy efficient? Why not apply to the City's Home Energy Loan Program (HELP) to access funds and incentives? With utility incentives and GreenON funding available – there has never been a better time to make improvements to your biggest investment, your home. The City's Home Energy Loan Program (HELP) offers low-interest loans of up to $75,000 to homeowners interested in improving the energy and water efficiency of their homes. The funds can be used to upgrade your furnace, purchase insulation, water heater, windows, doors, and even install solar panels on your roof! You'll repay the loan over time as you save on energy. On average, HELP participants are saving $560 per year and using 30% less energy. For more information or to access an application now, please visit HELP! Join Fort York and The Bentway on May 24, 2018, 6-8pm at the Fort York Visitor Centre for a neighbourhood Open House to learn more about ongoing construction projects and the summer events programing schedule. Guests will be entered into a door prize for a pair of general admission passes to the Field Trip Music and Arts Festival, June 2-3, 2018 and Bentway swag. Learn more. • Learn more about the upcoming work in your community. • Receive updates and information from TCHC staff on the upcoming maintenances work. • Ask TCHC staff questions concerning the upcoming capital and maintenance work. Join Councillor Mike Layton and I to discuss the coming developments along Dupont and managing construction in the area. While we were able to successfully defend the Dupont Street Study at the OMB and ensure responsible development for the future of the north side of Dupont between Ossington and Kendal, two of the applications are slated for construction soon in Ward 20: 500 Dupont and 420 Dupont. My goal is to ensure that the impacts from construction are managed and limited – to do this, we need feedback from local residents and residents' associations! Once the location details for the meeting are finalized, I will be sharing a notification online and door-to-door in the neighbourhood. 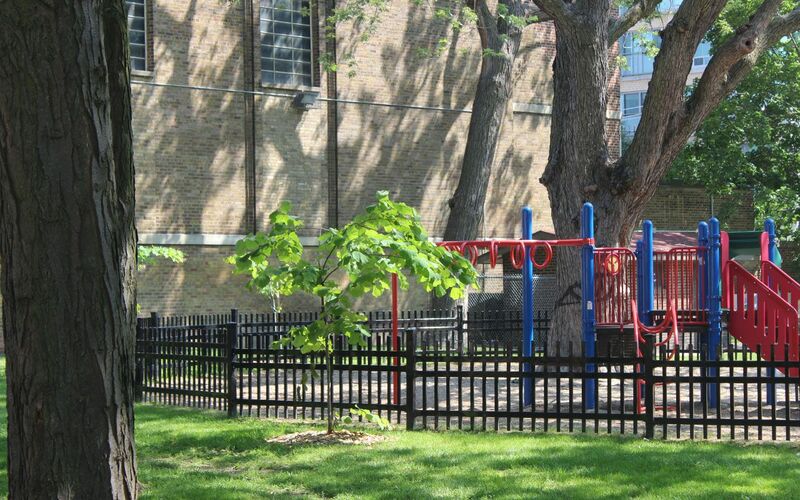 We’re expanding and improving St Andrew’s Playground! Please join me to advance the plans together. City of Toronto Parks staff will provide an update on work so far, projected timelines and next steps, and lead an interactive workshop to generate design ideas for the future of the park. The new season of Indulge at David Pecaut Square each Thursday starts this week. "Indulge your senses" weekly. with fresh food, international flavours and locally grown produce. Indulge includes live music by Toronto-based musicians from 12:30 to 1:30 p.m. each week. Find the schedule of events here. The 19th annual Doors Open Toronto provides an opportunity to see inside more than 130 of the most architecturally, historically, culturally and socially significant buildings across the city. This year’s theme, “Film: The Great Romance” explores the city’s film and television industry. The program features historic cinemas, film and television studios, post-production houses, digital media studios, artist-run centres and film training schools. The program also highlights buildings that have been featured in film and television, many of which are often not open to the public. The full list of participating buildings is available at the Door Open website. The annual Bike to Work Day group commute to Nathan Phillips Square is on next Monday, May 28th. This is the official kick off for “Bike Month”, please join us for the Bike to Work Day Group Commute & Breakfast. More information about Bike to Work Day is available at Bike to Work Day. This free event will include musical performances, family activities, tours of City Hall, food trucks and more to celebrate the fourth annual Toronto Newcomer Day. See the event website for more details. Further, we will be consulting on a project to create a community mural on the back of the Jean Sibelius Park sign. Local artist Talie Shalmon will be painting the mural, in partnership with the Annex Residents' Association, StreetARToronto and my office. The goal is to create a beautiful mural that will minimize graffiti and tagging of the sign. The mural will be organized around themes such as nature, music and community. Help us come up with concepts for the mural!